Standing on the tiny white stage set up in front of the back bar of Supperclub last night, a drink sloshing nearly out of its glass in one hand, Skate It executive producer Scott Blackwood promised not to use the phrase "built from the ground up" while explaining his game. Boo me off the stage, he insisted, if I do... and then he proceeded to use the phrase. "If it's not built from the ground up, is it a port? Not really." Blackwood explained that before Black Box started their work on the Wii and DS versions of Skate, they had to figure out if the controls would work. "It we couldn't get that great flick it feel, we weren't going to do it," he said. Later on, while trying out the Wii version of the game for myself, I was told the team spent three to four months working on getting those controls right and for the most part, it felt like they succeeded. To play the Wii version, you hold the remote flat, facing it toward the screen and then move it around as if it is the board you are standing on. The A button makes your skater push with his foot, and the B makes him hold the board. The rest is done with motion. You turn by tilting the remote side to side, manual and nose manual by tilting the remote forward or back and do tricks by snapping the remote up, to the side or in tight circles. I was able to do quite a few tricks with the remote, including a new Kung-Fu move requires jumping up in the air and pushing both buttons at the same time, after just a few minutes with the controller. There was a slight lag between the motion and a jump, but it felt like it was something built into the game on purpose rather than a design flaw. The turning was tight and responsive and for the most part if felt like a Skate game. 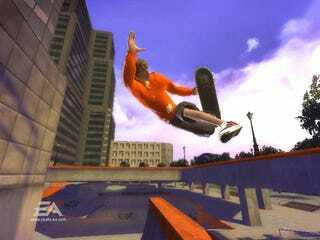 One very noticeable difference is that in Skate it on the Wii there are no pedestrians. The developers explain this away by saying a series of disasters have struck the city, leaving you with a playground of upturned asphalt, broken signs and bent rails to skate in, but I suspect that some of that decision was also driven by the necessity of developing an Xbox 360, PS3 game for the Wii. While the game will also make use of the Wii Balance Board, allowing you to steer and do manuals with it by shifting your weight, we weren't allowed to test that out at last night's event. The game will have you leaving the city and traveling to real cities around the world to compete in skate events, the developers told me. While the graphics certainly take a hit, the slick feel of the controls, I suspect, will more than make up for that. I didn't get a chance to check out the DS version, unfortunately, but in the demo they showed how you will perform stunts by tracing lines across a skateboard on the touch screen. Most moves looked like they were made by drawing angles lines or open shapes, like a rough J or U, though one trick required a odd-looking loopdeloop.